UAS uses in the MEDIA | ENTERTAINMENT sector enable users to film and collect information in the form of media that is used to develop products to entertain and influence. This sector includes tasks associated with photography, videography, and professional cinematography that often include high-quality cameras that lead to relatively heavy payloads. The need to collect high-quality media generally makes UAS gimbal stabilization, hovering accuracy, payload capacity, and dual-controller capability key UAS attributes. This use focuses on collection of visual information to provide video and still images that present a visual depiction of key building and land features to motivate interest and sale. Information is taken from visually appealing angles, making first-person view (FPV) an essential performance attribute. Collected videos and photographs often require additional editing and production with specialized software to generate finished media products. UAS operations often include relatively short flights requiring launch from and operation in confined spaces. 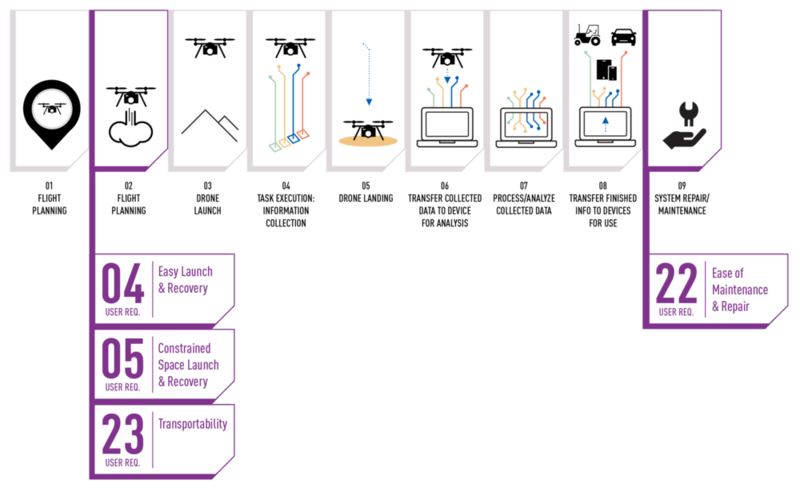 Due to the need to generally operate UAS close to structures, UAS attributes related to obstacle avoidance and first-person view (FPV) are often key in these applications. UAS use will enable collection of still and video photography that increase speed and/or value of sales by providing a novel and more comprehensive view of properties. Post-Flight Content Production: This use often entails collection of video, photographic or other information to document the condition of vertical work sites. The collected information often requires significant post-flight editing or production to generate products suitable to end users that can generate additional costs and requirements associated with UAS use. This use entails UAS operation to collect photo and video information from aspects not possible with other options, especially ground-based cameras. Collected information generally requires extensive editing and production to generate finished cinema-quality media. Due to the need to carry and precisely control high-quality cameras, this UAS use generally emphasize payload, gimbal stabalization, ability to hover, and dual-controller capability. Specialized Training & Expertise: This use generally requires UAS operators to possess specialized expertise associated with filming and production.